This San Antonio / San Josep villa comfortably sleeps 10 guests. Reyo de Sol is a beautiful Morroccan style Ibiza Villa, stylish and very comfortable. The villa is close to many shops and is a short walk from Port des Torrent beach, where a brand new beach club will open in 2018. 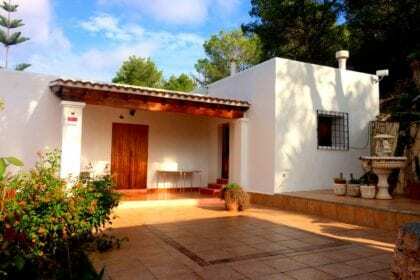 The villa sits in a very quiet road yet is only 10 minutes drive to San Antonio, 15 minutes drive to Playa den Bossa and Ibiza Town, 5 minutes drive to the infamous Cala Bassa Beach and its famous beach club. For those who do not hire a car there are supermarkets, bars and restaurants very close by. Groups who love the beach and do not want to travel very far, beautiful Blue Flag Beach, Port des Torrent beach, is a 5 minute walk. The villa is set in a wonderful walled garden with a court yard area. The property has a tranquil feel which creates the sensation of being in an oasis. You enter this beautiful Ibiza Villa which has a Morroccan theme throughout. The villa has 4 ensuite bedrooms, 1 with a kingsize bed and 3 others with double beds. There is also a sperate 1 bedroom annexe with a double bed plus its own bathroom / shower. There is a large open plan living room and kitchen. To the left is a sabina wood chill out area, satelitte TV, and feature fire place. The kitchen is fully equipped with a large American fridge freezer, coffee machine, gas hob with 5 rings, oven, dishwasher and a pantry storage area. There is also fiber optica high speed WIFI. The villa has mulitiple areas for relaxing, there are 3 terraces in the apartment, and 3 different areas in the main house, the courtyard, the pool area and the kitchen terrace. The property is in a very quiet area but its very easy to get to other places on the island – however many previous clients have commented they did not want to go out, because they were so chilled at the villa. The garden / courtyard has a large outside dining table and chairs which leads onto the wonderful pool area which has a BBQ and chill out house. For those who love their music the garden has outside speakers. Reyo de Sol is a wonderful ibiza villa, that is stylish, well designed and very comfortable. Its super convenient and has easy access to some of Ibiza’s best beaches, nightlife, bars, restaurants and supermarkets. It even has a local Blue Flag beach very close by. Perfect for groups and families.